The passenger sent off his report and pictures of his injuries to AA, hoping for a response, an apology, some sort of compensation for his medical bills and maybe a credit for his flight. Weeks passed and he heard zilch from American. Fox News did a story on it and the airline finally responded. However, the airline that responded wasn’t American, it was Virgin Atlantic. 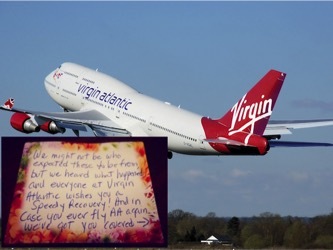 Virgin sent flowers, a hand written apology letter and best of all sent him protective equipment – kneepads, elbow pads and wrist guards for his next AA flight. Kudos to Virgin Atlantic for stepping up and taking advantage of an opportunity to be a hero and making AA look even more like the villain. It is the beginning of the New Year and everyone has big goals they want to accomplish this year. Great, write them down, state them, share them with your team, even post them, and then forget about them! The big goal is not where your day-to-day focus needs to be. It needs to be on the micro action steps and measurements that will accomplish them. Personally or professionally, your BHAG (Big Hairy Audacious Goal) may be to lose 10 pounds, run a marathon, or to increase client referrals, client retention, or your customer satisfaction by 25%. Regardless of your BHAG, if you are constantly measuring your progress by your goal, you will get discouraged, panic and lose the momentum you need to persevere. After one month, you may have only lost one pound of the ten you need to lose. Which means you have nine more pounds to lose. Or you haven’t seen a significant impact in your client retention yet. When comparing to the BHAG, your minor progress seems insignificant. However, when you break it down, you might be ahead of your goal. In order to lose 10 pounds in a year, you need to lose a little over .8 pounds a month, and you have lost 1. And your client retention numbers have nothing to do with last month. You might have consistently delivered an incredible customer experience in January; however, your February retention rates are predicated on the experience your team delivered 6-12 months ago. The key to accomplish your BHAG is to forget about the outcome. Focus exclusively on the action steps and measurements that you can use as your daily dashboard to hold your progress accountable. When running the marathon, the runner isn’t focusing on the 21 miles they still have to run, they are focused on the pace they are running the current mile based on what their plan was. I am enjoying reading the book Wherever You Go, There You Are by Jon Kabat-Zinn. In it is an exercise I found extremely telling about how I view where I am at this point in my life. If your life were a book, what would you entitle the chapter you are in right now? Think about that. What you would name it says a lot about where you are at in your life and possibly what you need to do to get to a new chapter. Or you may love the chapter you are living right now, so focus on enjoying it, Carpe Momento, and making it last. I would love to hear from you what you titled the chapter you are in right now, email it to me at john@thedijuliusgroup.com and I will share you what I titled my current chapter. 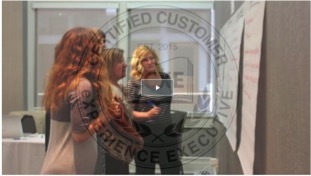 Online Customer eXperience (CX) training for executives is a few clicks away. 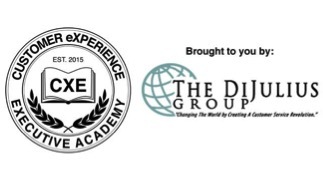 The fastest growing C- level position in recent years is the CXE – Customer eXperience Executive, and only the CXEA provides the education to turn you into an expert CX leader at your company. Next coursework begins this April.